Revised February 26, 2010 at 2:14 p.m. with updated information. 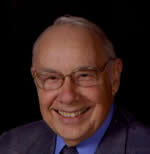 Former Park Forest resident, Dale K. Graham, died on February 24, 2010 at age 79. Dale resided in his home in Mokena, Illinois with his beloved wife Frances nee Kelly. Dale was the devoted father of Pamela (Casey) Chwala, Dale II (Kelly) Graham, Gregory (Pat) Graham, and Jenny (Robert Slawson) Graham and the loving grandfather of 11 and great-grandfather of 5. Dale was also the fond brother of Connie (Jerry) Johnson, and the late Robert (Catherine) Graham. Dale was an elder of Calvary United Protestant Church in Park Forest where he was a member since 1959. Dale also served as a Trustee for the Village of Matteson for 13 years; was President of his Homeowners’ Association; and a lifetime member of the Jaycee’s Organization. Visitation will be held on Saturday, February 27, 2010 from 3 p.m. to 8 p.m. at Hirsch West End Funeral Home, 3501 W. Lincoln Highway, Matteson, IL. On Saturday, March 6, 2010, the family will receive friends at Calvary United Protestant Church, 425 North Orchard, Park Forest, Illinois from 10 a.m. until time of the Memorial Service at 11 a.m. Reverend Dudley Elvery will officiate. In lieu of flowers, donations to Calvary United Protestant Church, Park Forest would be appreciated. Cremation rites will be held through Hirsch Lain-Sullivan Crematory. For information or to express your thoughts or memories in the online guest book, please call 708-748-3800 or visit www.hirschfuneralhomes.com.